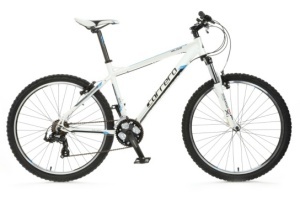 The Carrera Valour Mountain Bike is well rated amongst the mountain biking community. For someone who is thinking of taking up the sport, this bike would be the perfect option. The frame is made up of alloy, making it lightweight. The cyclist will also enjoy the aluminium front suspension forks. These come along with 21-speed EZ fire trigger shifters, giving one a lot of options.